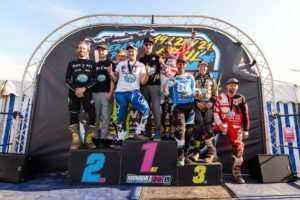 Tommy Searle became the third winner of the Huck Cup yesterday (Good Friday) as the fans turned out in their droves to a sun-drenched Marshfield for the 30th staging of the Mike Brown Memorial Meeting. Some pretty hefty watering made the track tricky in practice and it was Scotsman Shaun Simpson who was the quickest from this session in the Huck Cup part of the meeting, with a tremendous line up turning out in Memory of the much missed Mark Hucklebridge. 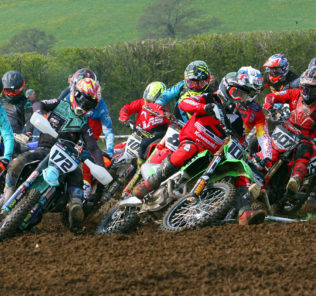 The NETT Quad Championship opened its doors on 2019 with the Brian Winrow Memorial Trophy and Rounds 1 and 2 of its series at Wooley Grange last weekend and also hosted the QRS and Tribal-MX ACU British Clubman Sidecars championship first round. 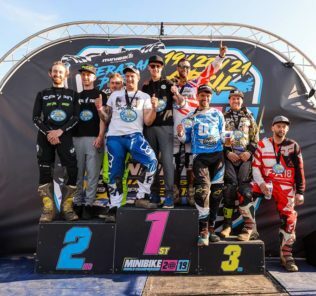 The first ever Minibike of Nations took place yesterday at Kieradan Park as a fantastic precursor to a full-on weekend of Minibike World Championship action. 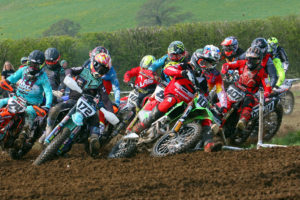 The 2019 DTRA Nationals and Hooligans championships, supported by Indian Motorcycles, kicked off (as is now tradition) at the Adrian Flux Arena, King’s Lynn over the weekend of 13th and 14th April. The spectacular racing from contenders old and new – and on their equally spectacular, old and new machines – promises that we’re in for another memorable year, which is bound to be full of surprises. What’s your biggest racing achievement to date? I finished 17th overall with the East Anglia Club last year and currently 10th in the championship with them this year and 2nd overall with Kensworth in their championship. The second weekend of racing in the British Sprint Championship saw Champs Parc in Kettering provide a tight and technical challenge, in stark contrast to the opening round. At 20 years of age and as the newly crowned SuperEnduro Junior World Champion, Eurotek KTM’s Will Hoare is setting his sights on success in the World Enduro Super Series. As a self-supported privateer, Hoare contested a couple of WESS rounds during 2018 before going on to win the FIM SuperEnduro Junior World Championship during the winter. A rider with bags of talent, he’s now found his way onto the experienced Eurotek KTM team for 2019, alongside South African teammate Travis Teasdale. All four of their ace red bike racers finished inside the top five overall with both James Dodd and Ashley Thomas on the podium. Feature Racer update – Harry Walker’s Quadcross plans for 2018!